When it comes to brownies, everyone has their own opinion on what's "best" and that's totally fine! For me, the ultimate brownie has no nuts, a fudgy center, and a verrrrrrry chewy top (I am definitely a person who loves the edge pieces). As for finishing the brownies with a dusting of sugar, I'm 50/50 on it. I think it makes brownies look prettier, but I actually like treating my super sweet brownies like I treat my chocolate chip cookies: sprinkling them with flaky sea salt. Try it! With that said, read through my ingredients list and feel free to make changes to adapt to your own liking. For example, if you want to add nuts, I would suggest adding a cup of toasted chopped pecans or walnuts. Also more importantly, you'll notice that there are three different forms of chocolate in this recipe: 1) cocoa powder 2) chocolate chips and 3) a 4 oz. chocolate bar, like Ghirardelli or Lindt. 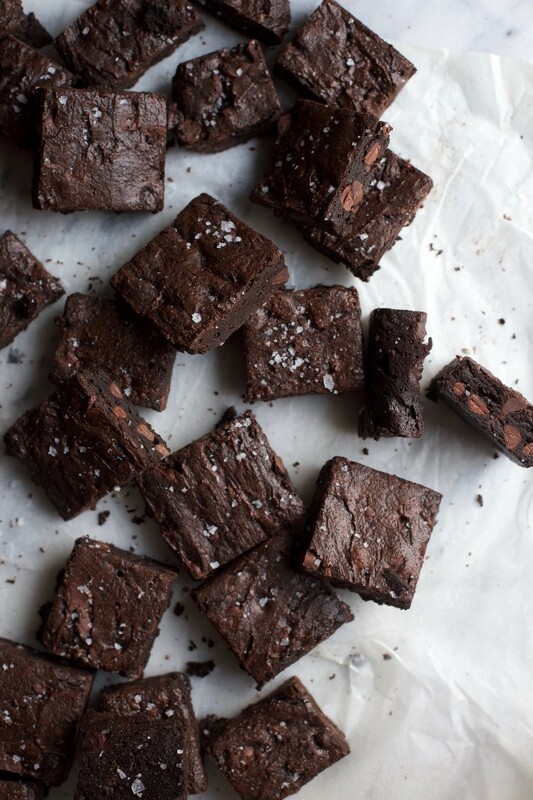 All three are necessary to creating the ultimate brownie recipe! But I actually make it more complex by using a blend of cocoa powders (regular and dark) and a mix of chocolate chips (semi-sweet and dark). This is totally an option for you and not necessary - I'm sure you don't want to spend extra $$$ on two different kinds of cocoa powder and chocolate chips. If that's the case, don't do a cocoa blend and use one kind of chocolate chip (semi-sweet is what the original recipe calls for). I just so happen to love dark chocolate and I think the intensity from it just adds to the overall flavor of the brownie. Also, the dark cocoa powder makes the brownies almost black in color which is pretty cool. We can call them 'Goth Brownies'. Or not. Anyway, you do you! Preheat oven to 350°F. Butter and flour a 9"x13" baking dish (another option is to butter the dish and then line it with parchment paper - this allows you to easily remove the brownies out of the dish). In a microwave-safe bowl, melt the butter and 2 oz. of the semi-sweet chocolate bar together. Do this in 30 second intervals, stirring well after each time, being careful not to burn the mixture. Once melted, transfer the mixture into a large bowl. To the butter and melted chocolate mixture, whisk in the sugar until well incorporated. Add the eggs and vanilla extract and whisk again until mixed. Add the cocoa powder(s), flour, espresso powder, salt, the other 2 oz. of chopped chocolate, and chocolate chips to the bowl. Use a spatula to mix together. It will be very dry at first, but with some arm strength, it will form a very thick and fudgy batter. Spread the batter into the prepared baking dish and bake for 30-35 minutes, or until a toothpick inserted in the middle comes out with a few crumbs - you don't want to see any raw batter on the toothpick. Dust brownies with powdered sugar or flaky sea salt. Allow the brownies to cool before cutting, or if you cannot wait, just try not to burn your tongue.